Pizzapocalypse! $1.50 for 2 Bros. Pizza? Melvin Felix The new slice. What’s more shocking than Michael White’s new pizzeria Nicoletta getting zero stars from The Times? How about 2 Bros. Pizza breaking the dollar barrier? 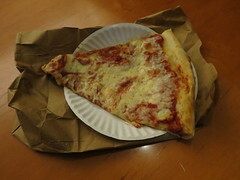 If that extra 50 cents is going to break the bank, relax: you can still get the dollar slice at the original location at 32 St. Marks.